. The excess energy is transferred to photons and thus heats the lattice. One of the advantages of excitation with an electron beam is that the band gap energy of materials that are investigated is not limited by the energy of the incident light as in the case of photoluminescence. Therefore, in cathodoluminescence, the "semiconductor" examined can, in fact, be almost any non-metallic material. In terms of band structure, classical semiconductors, insulators, ceramics, gemstones, minerals, and glasses can be treated the same way. 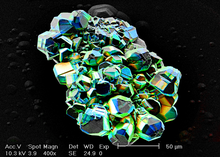 Color cathodoluminescence overlay on SEM image of an InGaN polycrystal. The blue and green channels represent real colors, the red channel corresponds to UV emission. The primary advantages to the electron microscope based technique is its spatial resolution. In a scanning electron microscope, the attainable resolution is on the order of a few ten nanometers, while in a (scanning) transmission electron microscope, nanometer-sized features can be resolved. Additionally, it is possible to perform nanosecond- to picosecond-level time-resolved measurements if the electron beam can be "chopped" into nano- or pico-second pulses by a beam-blanker or with a pulsed electron source. These advanced techniques are useful for examining low-dimensional semiconductor structures, such a quantum wells or quantum dots. ^ Klein, C. A. (1968). "Bandgap dependence and related features of radiation ionization energies in semiconductors". J. Appl. Phys. 39 (4): 2029–2038. Bibcode:1968JAP....39.2029K. doi:10.1063/1.1656484. ^ Lähnemann, J.; Hauswald, C.; Wölz, M.; Jahn, U.; Hanke, M.; Geelhaar, L.; Brandt, O. (2014). "Localization and defects in axial (In,Ga)N/GaN nanowire heterostructures investigated by spatially resolved luminescence spectroscopy". J. Phys. D: Appl. Phys. 47 (39): 394010. arXiv:1405.1507. Bibcode:2014JPhD...47M4010L. doi:10.1088/0022-3727/47/39/394010. ^ Zagonel; et al. (2011). "Nanometer Scale Spectral Imaging of Quantum Emitters in Nanowires and Its Correlation to Their Atomically Resolved Structure". Nano Letters. 11 (2): 568–73. arXiv:1209.0953. Bibcode:2011NanoL..11..568Z. doi:10.1021/nl103549t. PMID 21182283. ^ "What is Quantitative Cathodoluminescence?". 2013-10-21. Archived from the original on 2016-10-29. Retrieved 2013-10-21. ^ García de Abajo, F. J. (2010). "Optical excitations in electron microscopy" (PDF). Reviews of Modern Physics. 82 (1): 209–275. arXiv:0903.1669. Bibcode:2010RvMP...82..209G. doi:10.1103/RevModPhys.82.209. hdl:10261/79235.